It was Manchester United’s patchy away form that eliminated any hope of challenging for the Premier League title last season, however fanciful the dream. In 19 matches at home, Louis van Gaal’s side dropped points in just five games – the third best record in the league. The Reds’ away form was bettered by six clubs though, including Southampton and Liverpool. Not good enough from a side that developed a strangely inhibiting caution on-the-road during Van Gaal’s first campaign with United. 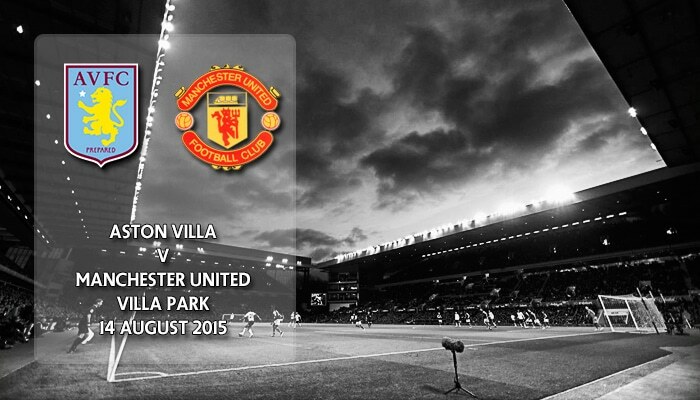 It is a record that the Dutchman hopes to correct during Friday night’s visit to Aston Villa. In keeping with the pattern United enjoyed a victorious, if at times fortunate, start to the new season with a 1-0 home victory over Tottenham Hotspur last Saturday. The Reds’ stilted passing and slow build-up was reminiscent of so many games last season, albeit with the caveat that the side remains a little undercooked. Van Gaal’s team played just four matches in pre-season. The club’s strengthening in defence, midfield and attack will do no harm to that imperious home record. It is the points total away from Old Trafford’s comforts that will determine whether the Reds challenge Chelsea and Manchester City for the Premier League next may. Certainly, Morgan Schneiderlin and Bastian Schweinsteiger stiffen United’s defensive resolve away from Manchester; Memphis Depay adds pace and goals on the break. Matteo Darmian and a newly fit Luke Shaw add genuine balance to the side from full-back. Yet, United’s cautious outlook against Tottenham, with two defensive midfielders deployed at home, suggests Van Gaal is not yet ready to open up United’s attack. After all, the team swung from tactical inhibition to liberation with startling alacrity last season. That cautious approach leaves Ashley Young in the side, as much for his defensive work as an attacking threat. The former Villa player created just one chance against Spurs, failed with each of six take-ons, and delivered just one accurate cross. Meanwhile, Memphis is deployed – for now – where he can do least defensive damage through the centre, and Juan Mata is restricted to a wide role that too rarely allowed the Spaniard to roam inside last weekend. Still, the Dutchman recognises that there is a weakness in United’s results away from home, if not yet that the tactical approach may be the over-riding inhibitor. Survival, says Van Gaal, was the goal last weekend. “The key for success this season is improving in away matches. We were one of the best last season at home, third. I want to create a fortress at Old Trafford, we did that – but away we have to improve and we can improve because last year we were not good,” admitted Van Gaal on Thursday. 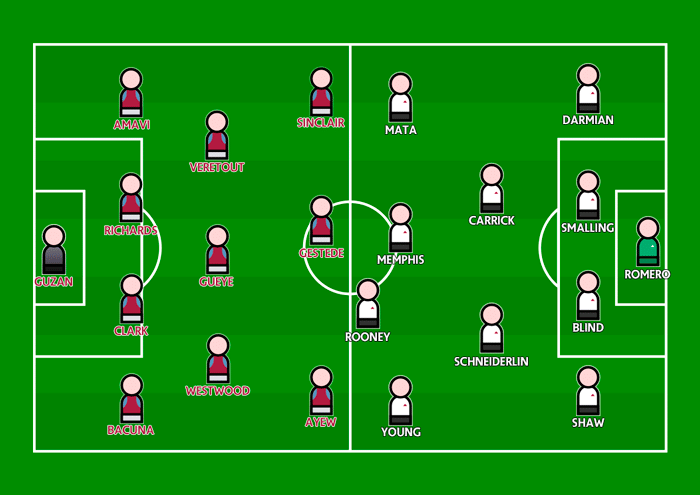 The roles taken up by Young, Mata and Memphis will do much to determine that development in the coming weeks. As, many supporters might add, could Ander Herrera. The Basque is likely to be restricted to the bench once again for United’s trip south, although his speed of passing and movement appear to be a missing ingredient. For the moment it is Memphis that will operate just off Wayne Rooney at Villa – “more a second striker than a third midfielder,” according to Van Gaal. Villa, meanwhile, enjoyed victory at Bournemouth on the opening day of the season; one that few pundits forecast before the game. Manager Tim Sherwood lost two key players this summer in Christian Benteke and Fabien Delph, acquiring eight new faces for a net spend of minus £6 million this summer. Despite the Premier League’s huge broadcast revenue spike, Villa owner Randy Lerner continues practice an austere investment strategy, although, bizarrely, Sherwood was moved to praise the American this week. “He is willing to back this football club and take us in the correct direction,” said the former Tottenham coach. Strikers Jordan Ayew and Rudy Gestede, acquired from Lorient and Blackburn Rovers respectively, are expected to fill in for Liverpool-bound Benteke. Micah Richards is a big-name, if under-performing, capture on a free transfer from Manchester City. Slim pickings from which Sherwood must work. By contrast Van Gaal’s resources are plentiful. It remains to be seen whether the Dutchman can extract more from his team away from Old Trafford. Van Gaal could deploy the same team that started against Tottenham last Saturday. The Dutchman is without Marouane Fellaini, who serves the second of a three match suspension, while Phil Jones is out with thrombosis. Marcos Rojo is not yet match-fit, and will not be considered, although Bastian Schweinsteiger is closer to full fitness after making his début as a substitute last weekend. The United manager confirmed that Sergio Romero will continue in goal, with David de Gea not in the right frame of mind to play while a mooted transfer to Real Madrid remains on hold. Meanwhile, Rudy Gestede, Villa’s goalscorer at Bournemouth, is pushing for a start after coming off the bench to net the side’s winner on the south coast. The striker must oust long-term Villa favourite Gabriel Agbonlahor, although the presence of midfielder Daley Blind in United’s back-four could swing the decision the Frenchman’s way. Jack Grealish and Carles Gil are not yet fit to play despite returning to training this week. Last season’s away draw at Villa was so typical of the dreary, unimaginative, pedestrian, chance-free football served up by the philosopher’s team for much of last season, especially against sides lower in the League. Van Gaal’s players were at their clueless best in attack and it was mind-numbingly excruciating to watch. The inability to score two goals a game (sometimes even just one goal) cost United plenty last season and if Saturday’s performance against Spurs is anything to go by, we could be in for more of the same. Okay, it’s early doors and there are new players to bed in etc. but with close on a quarter of a billion pounds spent on the transfer market there are few places left in which The Cautious One can hide.